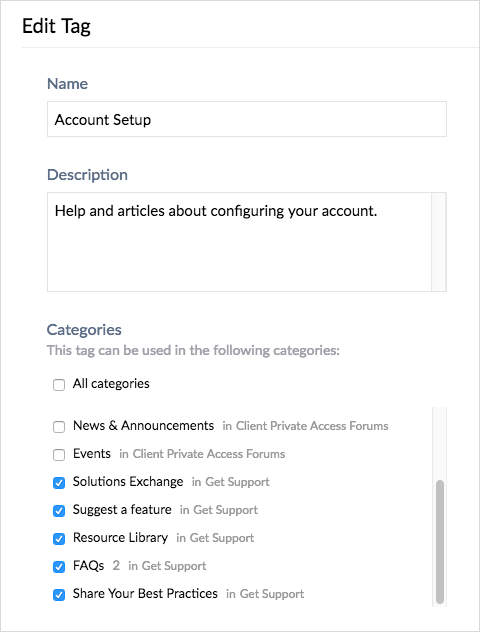 We are pleased to announce the new Community Tags feature! What are Tags? Tags are like keywords or phrases that can be added to posts. By assigning tags to posts, relevant content can be more easily discovered. Clicking a tag shows other posts that have been given that tag. Tags are included in search results. Tags that match the search term appear at the top of the results. 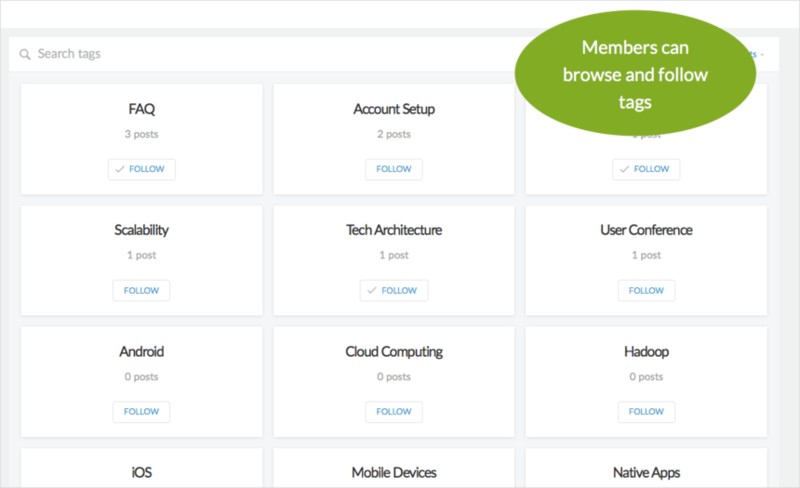 Members can browse tags and follow tags of interest. To create tags, go to Admin > Categories > Tags. 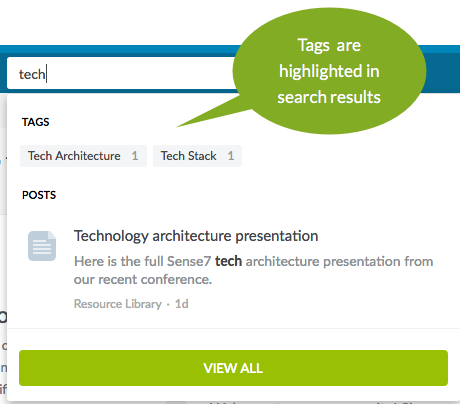 A tag can have a description and category assignments. A tag can be used in all categories or restricted for use in only certain categories. 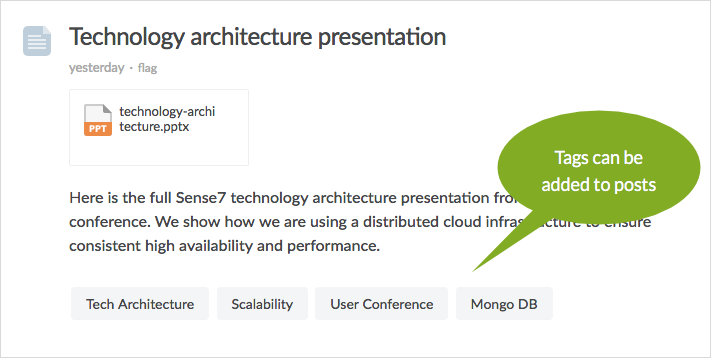 For example, tags that are only relevant for your Knowledgebase articles can be assigned to those categories. Is it possible (perhaps via a configuration option) to require each post to include at least one tag? Hi Kevin , not at this time but we can track this as an enhancement. Thanks! We would like moderators to use tags but also restrict other users from beeing able to add tags - is that possible? Hi Carola , yes you can restrict the ability to add tags to moderators only. This setting has now been enabled for your account. We would also like to give our moderators the opportunity to manage the tags for our community. As far as I understand (by some testing), only the adm that these rights. Hi Rob, you are correct -- currently you need to be an admin to manage tags. Thanks for sharing your feedback on this, we'll track it as an enhancement request. How can I tag an item after it's been posted? Hi sue , click 'Edit' under the cog menu to edit the post. You can add tags there, then click Save. Hi sue , you can add tags to topics (discussion threads) but not to individual replies in the thread. I'm not sure if this what you are looking to do, but I thought I'd mention there is a separate feature that provides the ability to add a label/badge to a reply. For example, you can label a reply "Official response" or "Featured". Click the cog icon on the reply, and select Label. You can choose from the default list of labels, and you can add your own custom reply labels in Admin > Settings > Labels. See this article for more info on labels. Thanks - what I was looking to do is, eg, a sales person posts a question looking for a datasheet, and someone responds and attaches a copy. I wanted to tag the response (tag is 'collateral') but that's not possible. Hi sue , thanks for clarifying! You are correct, in this case the solution would be to tag the original post, since replies cannot be tagged. You can also pin the reply so that it appears at the top of the reply list in that post.